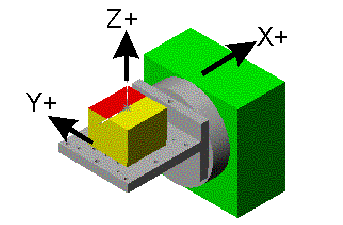 You have a CAD model of a part which you want to mill a face that is at a compound angle. You can position a part so that any face that is at a compound angle is straight up by making two rotations of the part. This will compensate for any number of compound angles on the part. 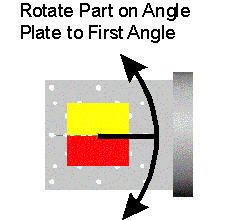 Whether you are using a five axis rotary table, or using a 4th axis rotary table and locating the part at a certain angle before the rotation, or are building a single fixture to hold the part at an angle, you can compensate for any number of compound angles and put the face up for milling just by calculating the two necessary rotations. But it can be confusing on how figure which angles to use. This calculator makes it easier. All you need to do is make a line perpendicular to the surface you want to mill. If you are milling a face you need to draw a line perpendicular to the face. If you are drilling holes at a compound angle you can make a line from the bottom to top of the hole. 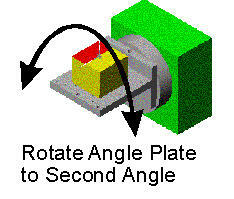 The result page will show what angles to move.